Help your backyard birds maintain their energy by offering them the Pine Tree Farms Insect Suet Cake. Suet, crafted from rendered beef fat, offers protein to your favorite songbirds, ensuring their high metabolism keeps working properly. Dried mealworms and crickets are included in this cake, along with ground peanuts and corn to appeal to a wide variety of birds. Place this cake in a suet feeder, and situate several around your yard for a wealth of feeding stations. You can also put this cake on a tray or platform feeder, for more birds to enjoy it. 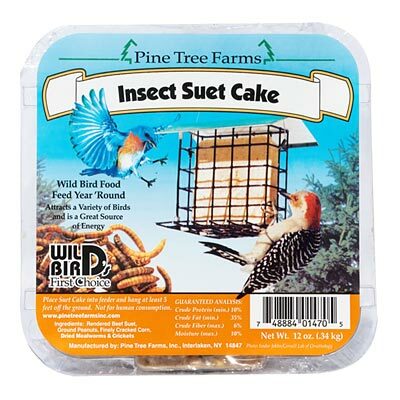 Offer songbirds a delicious blend of suet and insects with this Insect Suet Cake. Made in the USA. Note: This case pack contains 12 Pine Tree Farms Insect Suet Cakes.